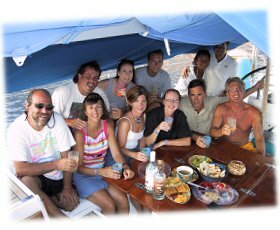 Have your own group of friends or family you'd love to sail with? And becauseobviouslythat means a lot less admin work for us, we'll give you a great group deal! Eg, get a group of 8 people together for Angelina (our 49' yacht), and it'll cost you just $900 per person; all our usual inclusions too! Or if you choose to go for the more luxury option of AnnaMaria, it will still come out to just $990 each. These prices apply if you like our "Adventure Sailing" concept - you're looking for a get-involved sailing experience, an adventure where you get to help sail the boat, decide where you're going - and take a turn in the galley too! This is our most popular option; and no, you don't need previous sailing experience, just a willingness to pitch in! However, you think the last thing you need on your vacation is to wash a single dish, or chop a tomato - or perhaps you'd prefer to have someone else hoist the sails whilst you soak up the sun; - there is also our full crewed option, where we put another SeaScape crewmember on board to take care of these details. Our trips are usually 6 or 13 days, starting on Sunday am and finishing on Saturday am occasionally, at the beginning or end of season, we can rearrange our schedule to do 10 day trips for full groups. This is not always available, however, so pls check in with us. If you have a smaller group of people, we do also have yachts in the 32'-44' range available, on which we can still give you the "SeaScape concept"ie, all-included, no-worries-along-the-way package! (And a SeaScape skipper too. . .that's important). Please contact us for more info. In short, once you are on the boat, everything is covered; just dinners ashore and any personal expenditure on the land are up to you! On our "Adventure Sailing" program, your skipper will keep the boat well stocked with food and drink; but he/she is not responsible for preparing meals- everyone pitches in together in the galley! If you wish to have a first mate/cook on board to do this please see the "Fully crewed don't-lift-a -finger" charter option.